Designed for use in 4K(UHD) systems, the HVS-6000 brings 12G-SDI compatibility to all inputs and outputs. Users can operate the unit in the same manner as current HD systems. In an era of video over IP, the HVS-6000 anticipates these needs and enables IP interfaces to be mounted on all I/O slots*. *HVS-6000M is planned for future release. The HVS-100 and the HVS-110, the Hanabi series of portable video switchers, boast exceptional cost performance. HVS-490 switcher inherits key technology of HVS-2000 and HVS-390HS while opening the door to even more affordable 4K production. 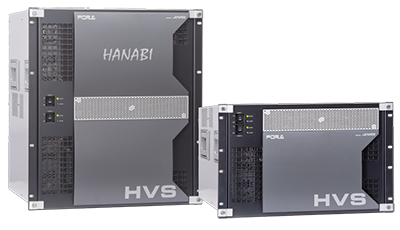 New generation of HANABI series, HVS-2000 is launched. Powerful 4K and 8K routing with 4K-UHD conversion and 12G-SDI compatibility across all inputs and outputs. Up to 64 inputs/64 outputs in a 4U frame. Up to 128 inputs/128 outputs in a 8U frame. Up to 256 inputs/256 outputs in a 16U frame. Up to 68 channels of mixed 3G/HD/SD-SDI, analog composite, HDMI, DVI, or RGBHV signals for monitoring on 8 screens. Dual channel frame synchronizer, SDR/HDR processor, converter, is the next generation technology from FOR-A. Software for centralized visual control of video switchers and other peripherals.